Peter Jenks has already written about his Morgan Plus 8. 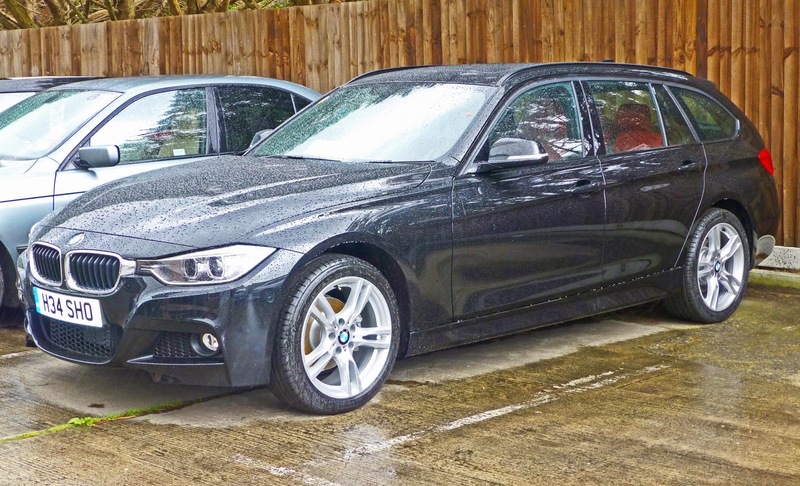 Here he reviews his BMW 320i X-Drive M-Sport Touring. What car are we talking about? 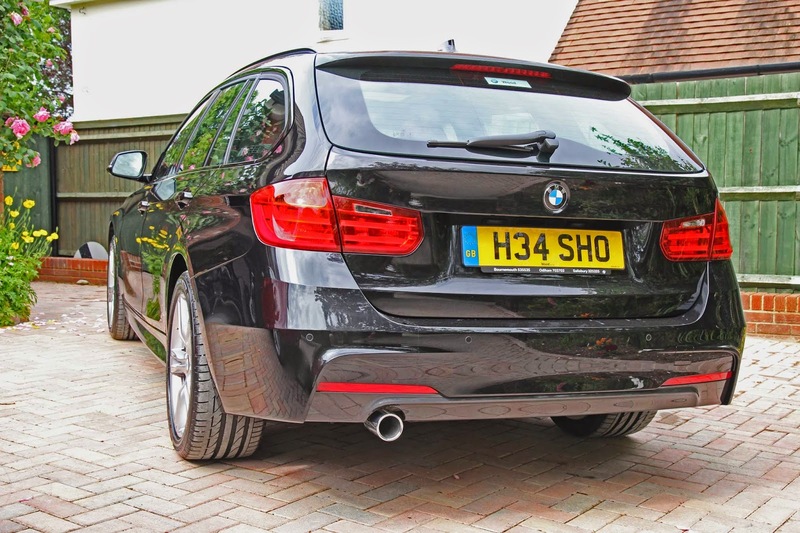 Delivered on 21 June 2013 it is a normal looking BMW 320i Estate with a few differences. I bought it to replace a Range Rover Evoque which was terminally unreliable, plus the seat was uncomfortable and I grew to hate it. We bought it because 2 winters in a row we’d been trapped in our home due to packed snow on the lane in front of the house. The Evoque was wonderful in the snow and ice. But it isn’t a car and I grew to hate it. 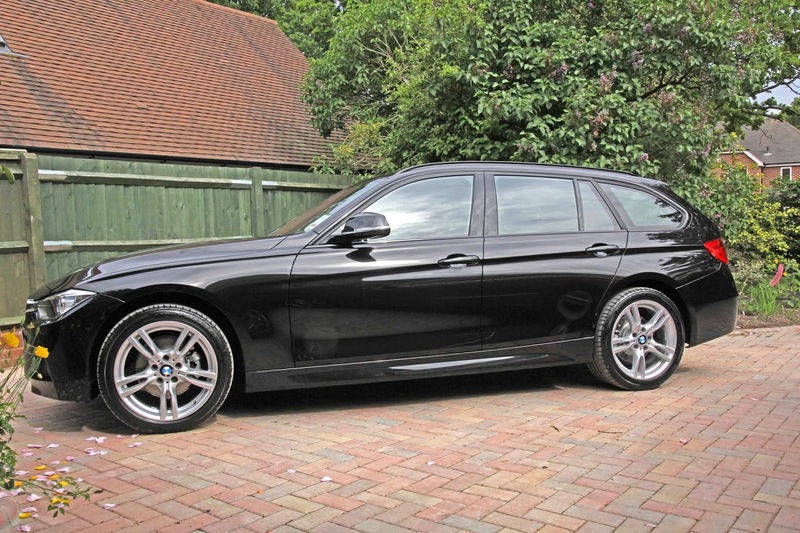 So the BMW seemed the answer: a sensible, sporty estate with X-Drive, BMWs proper full time four wheel drive, normally biased 60% rear but can be up to 100% front or rear as the computers think fit. Then I added “M Sport,” a nice body kit and some other under the skin changes to make it more “sporty”. It is finished in Sapphire black, a metallic black and inside with burgundy red leather. On the outside all badges have been deleted. Why red leather? Because on the M Sport grey wasn’t an option, only brown and black: a black car with black or brown inside? No thanks! All the other electronic driver’s aids I ignored: having experienced them on another car I felt they are mostly distracting and can be irritating, though it I did a lot of motorway driving the adaptive cruise control would be worth considering. So 18 months and almost 15,000 miles later what are my impressions? Mostly good, the engine took the best part of 5000 miles to loosen up nicely and now in SPORT drive + SPORT gearbox modes it is quick, although it sounds a bit rough at high revs and it drinks fuel. Indeed the engine sound at cold idle is almost diesel like, quite gruff and with an obvious rattle but once warm and above 1500 rpm it becomes quite smooth, but a silky BMW 6 it isn’t and the throttle response flatters to deceive: turbos may give great gobs of low rev torque by instant throttle response is no longer an option. . The electric steering is better than many, not too light and very direct with a reasonable amount of weighting but little true feedback. Placing the car on the road is easy, as is parking. Cornering, especially on twisty back roads seems, at first, to be amazing. The car feels glued and despite my best efforts I’ve not got the traction control warning to come on, clearly I must try harder! With full time 4-wheel drive able to put 100% of the power to either end of the car as needed the way it goes round sharp uphill bends is remarkable. But to have any fun at all it has to be thrashed, hard work and costly in terms of fuel consumption and I get the feeling the car would rather not, if you don’t mind. Driven normally it is secure and bland. Really the car also needs more power! 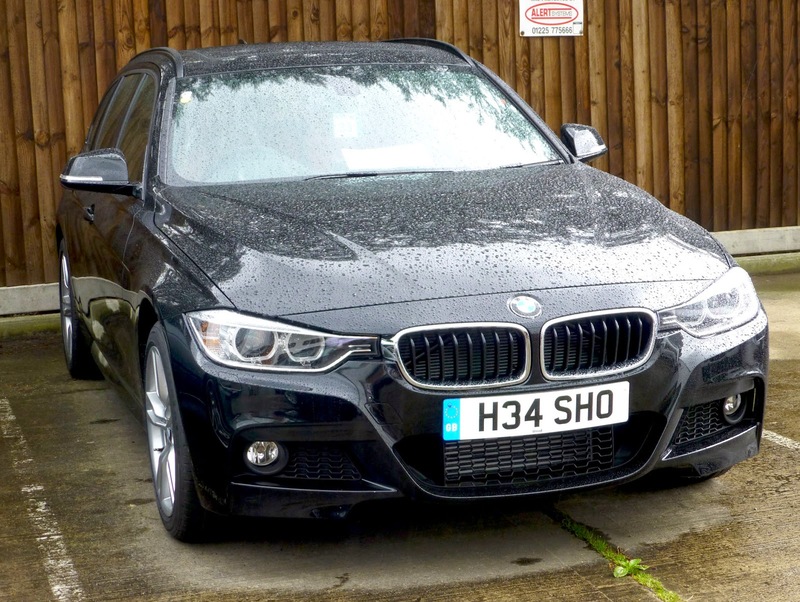 With just over 180bhp and a sophisticated 4WD system it is a terribly safe and a bit tedious. Sadly unlike in Germany and the USA the 330i 6 isn’t offered here, but you can always go silly and with the Alpina! Autocar liked it and you can have it as an X-drive estate! With winter tyres on it the ride is slightly better, it is quieter and the cornering seems to be just as secure as on summer tyres, but at over 80 mph there is some directional instability and the winter tyres will howl quite well if pushed very hard More about tyre noise later. It is averaging just 32.5mpg, but this includes urban driving: on longer motorway drives high 30s are easy and I’ve seen 42 mpg, providing that the sport drive and gearbox modes are not selected. Yes they bring the car alive, but at a cost. Conversely using the “eco-pro” mode improves fuel consumption further at the expense of dulling all responses: it is best suited to motorway driving with the cruise control. The car loses all personality and becomes mind numbingly boring. The “stop – start” mode works well with the auto box, it can be disabled either by switching it off or by putting the transmission into sport mode. 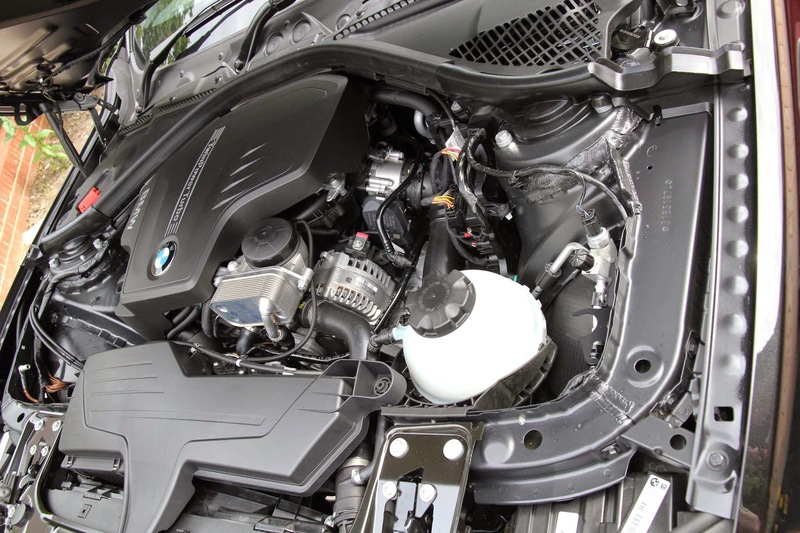 The engine seems to use no oil, although the lack of a conventional dipstick to check is a slight concern that BMW clearly believe I need not worry about. The car will tell me if it needs oil! Indeed the car will tell me of its needs in general, though the very clear display. It takes time to learn the complexity of the system, which is driven through the i-drive controller and not a fussy and slow touch screen. Although it is a spacious car with impressive rear room the car feels small to the driver, clearly it is designed to make the driver feel good sitting snugly in his cockpit with all of the instruments clear and un-fussy and the sports seats easy to adjust and very comfortable. The “HUD” works perfectly, giving the driver no excuse not to know how fast he is going and making the satellite navigation system voice commands almost superfluous as they appear in the display when needed, as do the cruise control and audio control displays. Talking of navigation systems this one is clear and up to date, although some postcode entries are not as simple as they should be it is generally easier to use than most. The way the Professional Navigation System integrates audio, radio including an excellent DAB system and an iPhone is impressive with many additional and useful features available through a BMW “App”. It also has a split screen system allowing, for example, the main screen to show the moving map and the sub screen to show what is on the radio or audio system. Not to opt for the Harmon Kardon audio upgrade would be to waste most of the benefits that come with the combination of an i-phone and the navigation system. Heating, ventilation and the other creature comforts work as expected, although the powered and memory seats are not as good as the Mercedes equivalents in our other car, despite costing the same. The lack of a memory for the passenger side is just petty. Conversely the adaptive discharge lights are impressive and effective, with BMW’s signature “angel rings” surrounding the 4 light units and acting as daytime running lights. The auto dip is almost spooky, with the 4 lights each controlled separately and the outer pair turning so that the verges are illuminated on quasi main beam without dazzling the car in front! They are much better than the lights on the Evoque or my wife’s Mercedes coupe: indeed they are the best headlights I’ve ever experienced. The standard reversing aid works well, I didn’t opt for the rather expensive front system and rear camera as the car seems easy to place. I feel that the optional panoramic opening glass roof is essential as without it the car can feel claustrophobic due to the black head lining and mostly black interior, relieved only by the wine red leather seats! Other than the total lack of driver engagement the noise in the car can be tiring: why? BMW is obsessed with run flat tyres. On a well-surfaced modern road they are impressively quiet but on the sort of crushed stone top dressing beloved by the UK Highways Authority on Motorways through the 80s and 90s they are unacceptably noisy at more than 50 mph. At times I was reduced to wearing earplugs, which is simply unacceptable. After much debate I dumped them for a set of Toyo Proxies, a vast improvement. Quieter and improved steering response as well. But with no spare I’m reliant on the BMW “inflator and goo” kit. That and an RAC membership…! Although the mirrors can be folded when parking there is no automatic locking setting so the driver has to remember to fold them back before leaving the car. Another serious irritation is that the rear wiper doesn’t turn on when the front wipers are on and reverse is selected. Instead if the rear wiper is on it goes from intermittent to continious, but you have to remember to turn the rear wiper on first. That is it: I think it is incredibly well made and engineered, other than the rear wiper it does exactly as expected. But overall it is a bit soulless. I’ll keep it for the three years until I retire, but after that? I doubt it.